The coming years will see a huge shift away from the cost and hassle of transport providers (authorities and operators) issuing ticket media, by allowing passengers to use what they have in their pocket (or on their wrist) to travel. 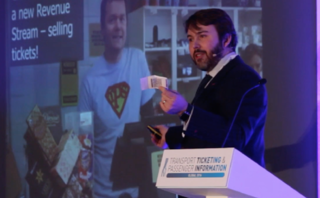 During Transport Ticketing Global, Ben Whitaker, Head of Innovation at Masabi, discussed how we see the future of transport ticketing as Bring Your Own Ticket (BYOT), whether that be a mobile phone, contactless bank card, smart wearable or ID card, etc. Different ticket media and technologies. How to build capacity in a transit system. How to move away from the cost of issuing ticket media. How to get rid of ticket queues, ticket vending machines and cash handling. Why you need to move to media agnostic readers. Masabi's JustRide Mobile Ticketing Platform allows passengers to buy tickets anytime, anywhere, while helping transport providers to move to full account based ticketing. To find out more check out our blog on The Journey to Account Based Ticketing.